Kia ora everyone, Term 4 at this moment we have no classes up and running, the schools are quite busy this time of the year and also i have been in visiting the schools we are attached to for Computers In Homes and trying a different approach to see how we can attract people to do the course. Stepping Up also has been having its ups and downs but we still have the program running at our town library every Tuesday night from 6 - 8pm. Internet, this has been lot of concerns and issues wether its the setup/Harddrives /faults and waiting procedure. Here is hoping 2016 will be a good year for us all. 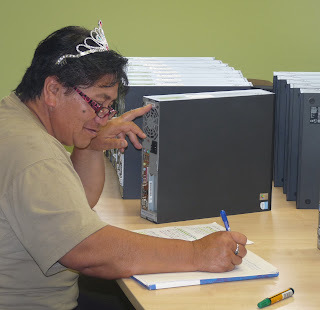 Just looking back on our Graduation Photo's i found this lovely photo of one of our nannies who has now passed on but she really enjoyed her time on her computer , she done a lot of her Maori Womens Welfare league on her Computer she use to say she was so glad she done the course. TERM 3 - We are underway with 2 classes of CIH - Ko Te Aroha - 5 , DPS - 8 and we also have a Stepping Up class going on a Friday morning. This Terms graduation will be held at the National Launching of Adult Learners Week at the Mens Shed, Colombo Road Masterton. ICDL(Jobseeker Kiwi skills) have started with 4 of us at this moment first time around as for myself i really enjoy doing this program because you can also do it at home or wherever you are and our Tutor for this program is Darren Poona. Stepping Up program has been introduced to the Masterton Library which will be up and running in August and the criteria for this course will be they need to sign up at REAP first. so looking forward for more new people. 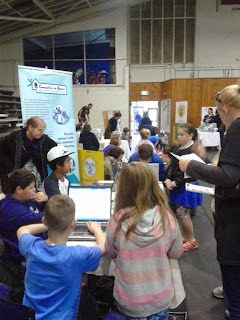 These recent photo's were taking at our Whanau Day 17th May it was a really awesome day we set up 4 Laptops and our tutor Lisa done questions up for the children who had to answer them by going into this website also she put up 5 other educational websites which they were allowed to go into after they answered the quiz then i spoke to the parents about our CIH program plus Stepping Up besides ICDL (Kiwi Skills). TERM 2 - Kia Ora everyone this term has been a bit of a topsy turvy for our CIH classes due to the number of people that sign up and then we have bit of a drop off due to people finding part time or full time jobs or otherwise they can't do mornings or afternoons only evenings but we still manage to have 2 classes up and running. At this moment we have a CIH class in Featherston which we had 6 signed up but 2 pulled off for work commitments so that leaves us with 4 to graduate. We have a CIH class also at Douglas Park School with a class of 8 which is good. The Graduation for these classes are : Fstn Tues 30th June @ 4 30pm @ Fstn School, DPS Mon 29th June @ Douglas Park School 4 30pm. Stepping Up - At this moment we have a class running on a Friday morning @ Ko Te Aroha and we have people going there because they have forgotten what they learnt from the first course. Its 2015 and Term 1 is pretty much on a go slow at this moment with only 2 classes up and running and they are been held @ Masterton Family Education & Support Centre on a Monday morning and the other one is been held at Douglas Park School, Friday morning. Stepping Up also has been underway which is been held @ Masterton Family Education & Support Centre on a Tuesday afternoon. The Graduation for the 2 CIH classes will be held @ MFESC 30th March at 4 30pm we will have a mixture of people graduating all from different schools. INTERNET CONNECTION - has been steady for people signing up. TERM 2 - We have a CIH class set up to go in Featherston hopefully also the Stepping Up. Hopefully this term will give me a chance to go and visit the schools that are connected into the CIH Programme.